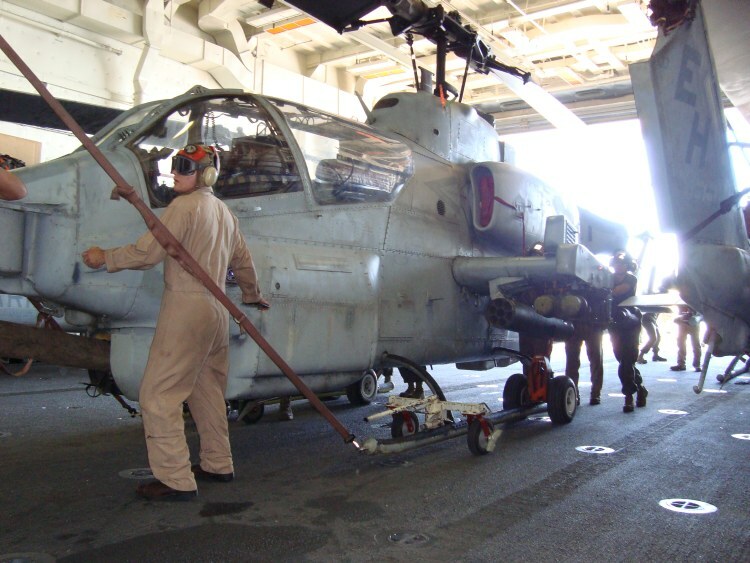 San Antonio (LPD 17), Persian Gulf, 09 November 2008 — Marines guide an AH-1W Super Cobra attack helicopter into the hanger deck of USS San Antonio, (LPD 17), Nov. 9, 2008. Approximately 75 Marines with HMM-264, the Aviation Combat Element of the 26th Marine Expeditionary Unit, flew to the San Antonio to practice flying “skids,” or non-wheeled aircraft like the Cobra and UH-1N Huey from the new ship. U.S.M.C. photo taken by Maj. Harald Aagaard. Read the story associated with this photo.